The only thing better than a warm, thick and chewy chocolate chip cookie straight out of the oven, is a chocolate chip cookie decked out with all the bells and whistles. 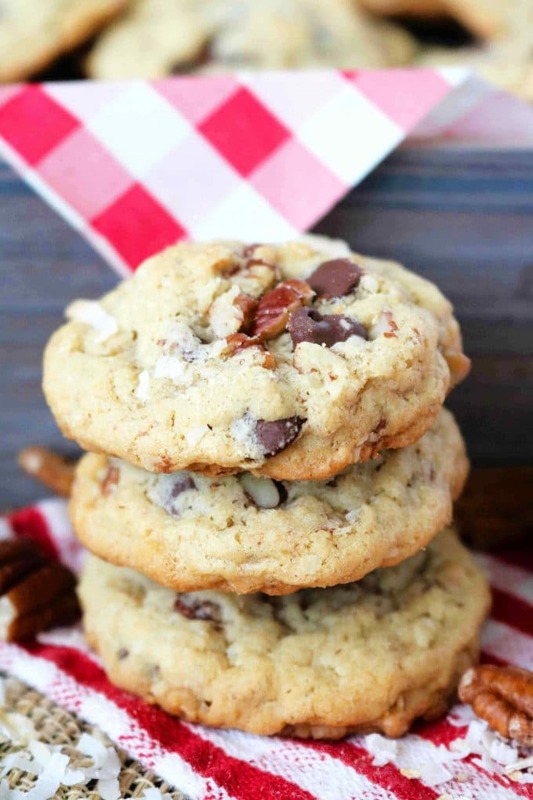 If you’re looking for the best Cowboy Cookie Recipe, addictively yummy with a perfectly moist, thick and chewy center, loaded with extras like coconut, pecans, and old-fashioned oats, you’re in luck. In addition the best Cowboy Cookie recipe (ever), we’ll also cover fun and helpful topics like how the cookie got its presidential start, how to customize the recipe for picky eaters, freezing the cookie dough for a headstart on your holiday baking and more! 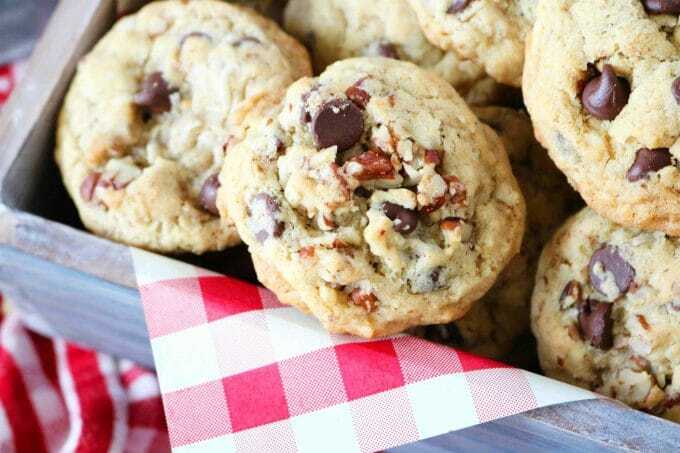 A traditional Cowboy Cookie Recipe will yield a soft and chewy chocolate chip cookie, fully loaded with extra ingredients like oats, chopped pecans, and coconut. To say the least, this hearty cookie is most definitely fit for a cowboy, and it’s my suspicion this is how the cookie got its name. However, this cannot be confirmed nor denied, as the origin of the first Cowboy Cookie recipe is simply nowhere to be found. A mystery indeed, but alas, at least we have our cookies to lean on during such confusing times. One thing we do know is the cookie soared into popularity thanks to former first lady Laura Bush’s recipe submission to the Presidential Cookie Bake-Off hosted by Family Circle magazine. 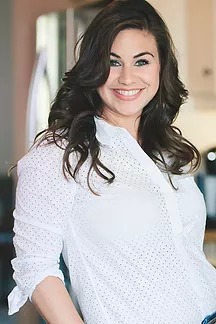 The bake-off is held during every presidential election year, and it is the presidential hopeful’s wives that do the competing. Lady Bush referred to her Cowboy Cookie recipe submission as “Texas Governor’s Mansion Cowboy Cookies,” and the rest is history. Unfortunately, Bush lost to Hilary in the cookie competition, but you can rest assured, the Cowboy Cookie Recipe you’ll find here, is a bonafide winner. 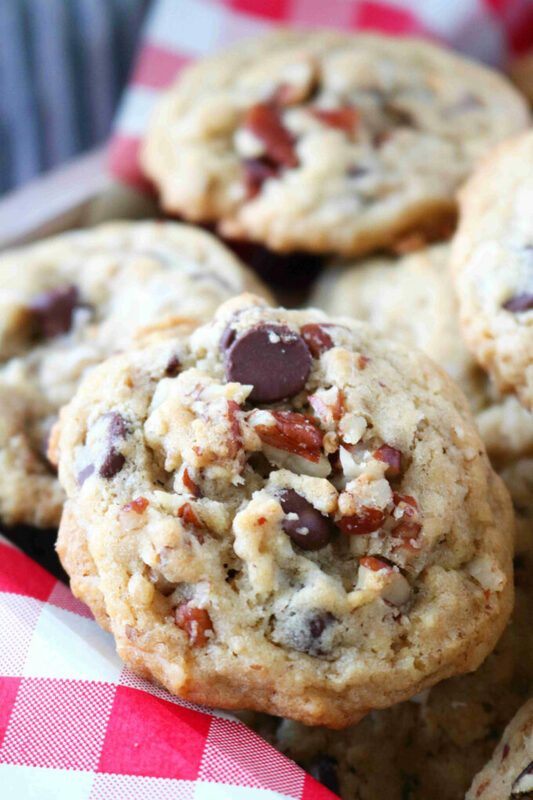 If you’ve ever made a chocolate chip cookie from scratch, you’ve already come pretty close to making Cowboy Cookies. The only difference is a few extra add-ins — rolled oats (not to be confused with quick-cooking oats), unsweetened coconut flakes, and chopped pecans. Whisk together dry ingredients: Flour, baking soda, salt, and cinnamon. Mix wet ingredients: Butter, granulated sugar, brown sugar, eggs, and vanilla. Add dry ingredients to wet ingredients and mix. Add the oats, chocolate chips, coconut, and pecans and mix. Scoop and bake 350° for 12 minutes. When it comes to this Cowboy Cookie Recipe, feel free to subtract any of the extra add-in’s you aren’t a fan of. 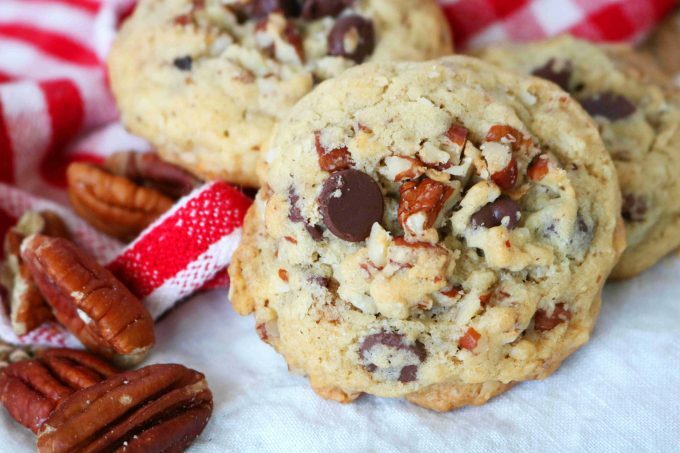 So, if you prefer a Cowboy Cookie without coconut or pecans, you can eliminate one or the other, and proceed confidently with this recipe. However, be sure to keep the base of the cookie recipe the same. That part should not be altered at all. Ingredients you can give-or-take are as follows: Unsweetened coconut, pecans, and cinnamon. If you want to give yourself a serious head start (like up to a 2-month head start) you can absolutely do that with this Cowboy Cookie Recipe. Freeze Cowboy Cookie dough balls, and pull off a batch of freshly baked chocolate cookies any day of the week, completely on a whim! To freeze Cowboy Cookie dough, transfer the dough balls to a snug, airtight, freezer-safe container, separate each layer of cookie dough with sheets of wax paper, and seal. Bake within 2 months for best results. Your freshly baked Cowboy Cookies will stay fresh for 3-4 days in a sealed, airtight container at room temperature. However, you can certainly freeze baked cookies to preserve them even longer. Once your cookies have baked and cooled, place them in a freezer-safe zip top bag, taking care to press out any excess air, and store for up to 2 months. You could also freeze them in a freezer-safe, airtight storage container, just be sure the container fits the cookies snugly, and there is not a ton of room for air to circulate around them. Oatmeal Chocolate Chip Cookies bake up perfectly soft every time (thanks to a special secret ingredient) and are full of old-fashioned oats and semi-sweet chocolate chips. A crowd-pleasing cookie guaranteed to be an absolute hit! Chocolate Drop Cookies with Chocolate Chips are a chocolate lover’s dream come true! Equipped with big chocolate flavor and loaded with melty, gooey chocolate chips! The Best Chewy M&M Cookies are perfect for holidays…or chore bait, whatever floats your boat. The perfect cookie base, all dressed up with colorful M&M’s! Soft Snickerdoodle Cookies come with big cinnamon flavor and a buttery, melt-in-your-mouth texture. The Easiest Chewy Peanut Butter Cookies are easy to make and take less than 15 minutes to prepare! Made perfectly old-fashioned with tine marks and a dusting of sugar, these cookies are a nostalgic favorite! 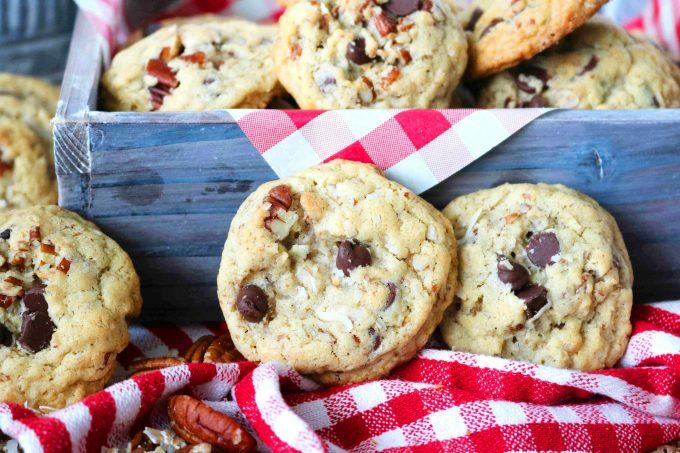 The best recipe for Cowboy Cookies! 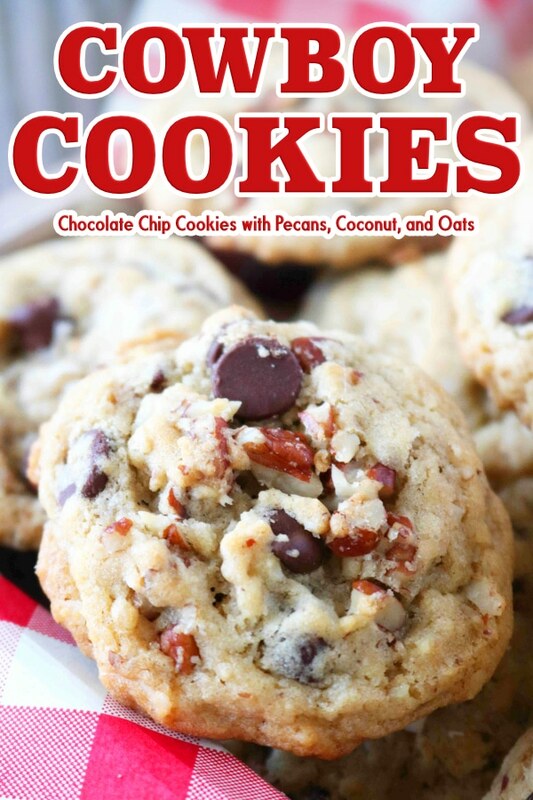 Featuring a fully-loaded chocolate chip cookie, with pecans, coconut, and oats! Preheat the oven to 350° and have ready a sheet pan lined with either a sheet of parchment paper or a silicone baking mat. In a medium-sized mixing bowl, combine the flour, baking soda, sea salt and cinnamon (if using). Whisk to evenly combine. Set aside until ready to use. Add butter, granulated sugar, and brown sugar to the bowl of a stand mixer fitted with a paddle attachment. If you do not have a stand mixer, use a large mixing bowl and a handheld mixer. Cream the butter and sugar for no less than 2 minutes on medium-high speed. Add the eggs to the bowl one at a time, mixing well after each addition. Then add the vanilla extract and mix until combined. With the mixer on low, gradually add in the dry ingredients, followed by the oats, chocolate chips, coconut, and chopped pecans. Stop mixing as soon as everything comes together. Scoop heaping tablespoons of cookie dough onto the baking mat spacing the cookies at about 2" apart. Bake for 12 minutes, until the tops of the cookies are golden brown. Serve and enjoy. I don’t think I’ve had a cowboy cookie before but these look really yummy. I’ll have to whip up a batch. So easy! You’ll love them! Yum girl! Gimme a stack of these right now because I can’t wait to make them! Srsly, love a good cowboy cookie any day. Sharing! I adore cowboy cookies! 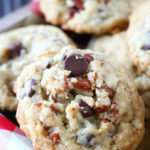 These look incredible with the pecans and coconut! YUM! My mom used to make these, but she called them a different name. I remember being really picky about them because of the nuts and coconut. What was I thinking? Those are some of my favorite things now! I’ll have to give them another go.